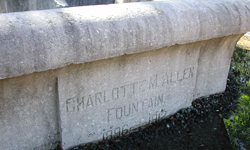 The carved limestone fountain in Elizabeth Baldwin Park is dedicated to the memory of Charlotte M. Allen, the wife of Augustus C. Allen, the founder of Houston. Its dedication includes the dates 1896-1912, which may refer to Mrs. Allen’s death in 1896 and the dedication of Baldwin Park in 1912. 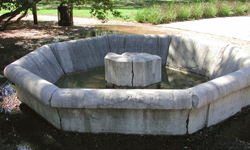 The fountain once included an elaborate, three-tiered centerpiece, which disappeared long ago. There is no artist’s name on it, and there are no records of its purchase or installation. Elizabeth Baldwin Park is named for Mrs. Allen’s niece, the wife of Rice University founder William Marsh Rice. It was acquired by the City of Houston in 1910 as part of a lawsuit settlement involving the last wills of the Rices, which conflicted in their bequests. Hers stated that the couple resided in Texas, a community property state, and left substantial sums to some of her relatives, while his stated that they were residents of New York and he had total control of dispersal of his fortune. The endowment of Rice Institute, as it was first named, depended on the successful resolution of his bequest. The wills were finalized soon after Rice’s murder in 1900, the university was successfully launched, and property for the park was acquired in 1910 and transferred to the city for a sum of $10.00.